Cotswold Edge named Best in the West! 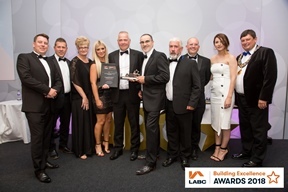 Our Cotswold Edge development in Mickleton has been named as the Best Development in the West of England at the prestigious LABC Building Excellence Awards 2018. The award recognises excellence in external appearance and internal planning, layout and landscaping, overcoming site constraints and attention to safety, security and accessibility – all factors which Newland Homes carefully considers when designing a new development. Cotswold Edge has proved to be a very popular destination for homebuyers looking for a countryside idyll nestled in the heart of the village and the last home on the development has recently been sold. However, homebuyers still have lots of choice of properties at other developments in the area with new homes now available in Evesham and Toddington, as well as a new site soon to open in Willersey. Jeremy Drew, Director at Newland Homes, said: “Cotswold Edge is an excellent example of the care and attention that we put into all of our developments. To have won the title of Best Development is testament to the expertise and dedication of all the Newland Homes teams involved in the design, planning and sales of these homes. “We pride ourselves on building great homes and communities. The properties at Mickleton feature Cotswold stone and slate where possible to blend in with the local vernacular and a mix of traditional homes and bungalows in response to local demand. We’ve also supported the local community through our time building on the site, including sponsoring events as well as providing funding and support to extend the cemetery and village hall.